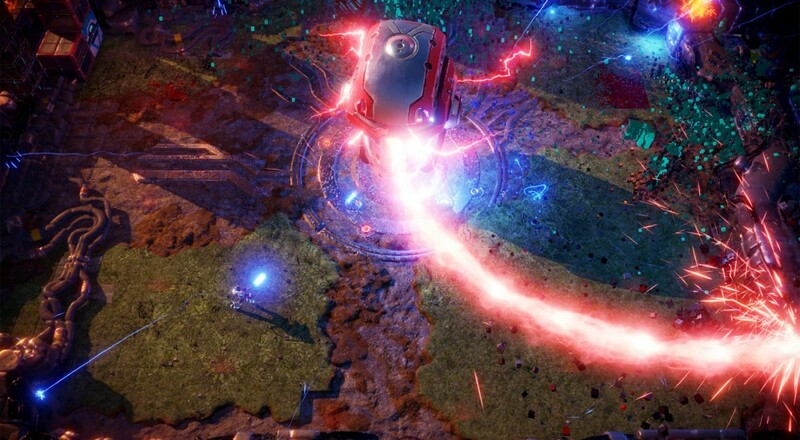 Nex Machina is the next twin-stick shooter from developer Housemarque. Rather than a solo effort, they’ve teamed up with Eugene Jarvis, the developer behind classic game Robotron 2084. Housemarque’s pedigree of arcade action shooters includes the likes of Super Stardust, Dead Nation, and Resogun - bringing a powerhouse of old and new gameplay to PC and PS4. Nex Machina feels heavily inspired by the latter, with Resogun’s voxel style graphics and futuristic theme all making an appearance. 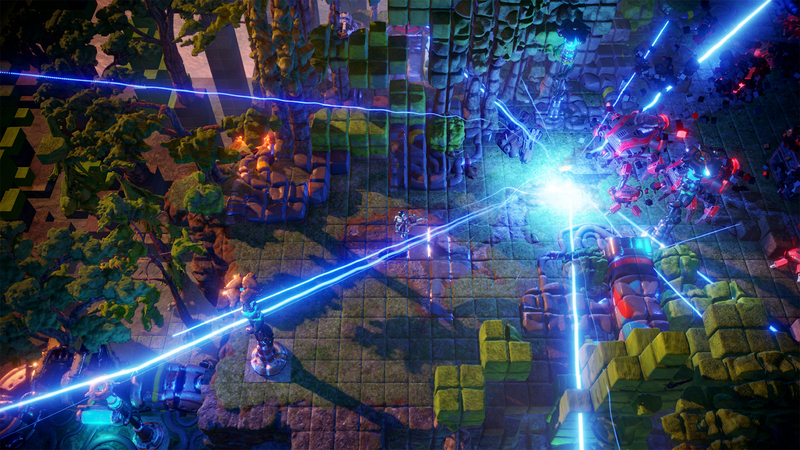 In Nex Machina you take the role of a little human player tasked with shooting numerous baddies. If you’ve come looking for a deep story, you’ve come to the wrong place. Instead, the depth of Nex Machina lies within the gameplay itself, where you’ll slowly uncover layers and layers of strategies and tricks to maximize your score. All of this occurs as you are clearing the enemies, rescuing humans, and avoiding bullets while slickly transitioning from room to room without ever being taking out of the action. As I mentioned earlier, the game shares a lot in common with Resogun. Each room requires you to “save the humans” to maximize score. Several rooms also have special enemies to kill that yield additional bonuses to score multipliers, and you’ll find patterned waves of enemies that yield special kills as well. Nex Machina layers several new concepts into the mix, though, with several secrets hidden in the destructible environments like humans, secret exits, rooms, and plenty of pickups to augment your firepower. While the player is initially armed with a standard shot, pickups increase its range or power, augment its fire pattern, or add secondary abilities like lasers or smart bombs. These are paramount to surviving when combined with your sole defensive capability - a dash maneuver. This ability allows you to warp through bullets, lasers, and create some space between you and the enemy horde. On the co-op side of the fence Nex Machina supports two player couch co-op in a shared screen format. 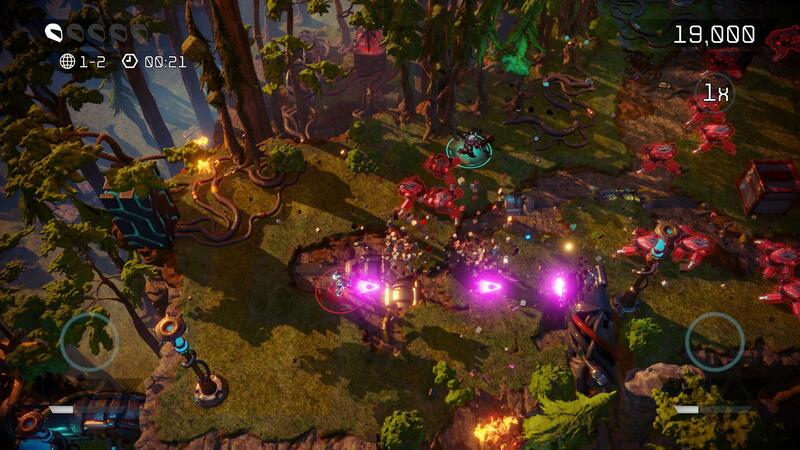 The camera dynamically adjusts to the players’ positions and pulls back as needed. If there’s a downside to this in co-op, it’s how easily you can lose a player on the screen in the chaos of voxel explosions and a fully zoomed out camera. You share a pool of lives, though both players have to die to actually fail a room. If a player does die, they’ll come back at the next room, and you won’t actually lose a life from the pool. Thankfully clearing a room only take a few seconds. This makes co-op a bit easier overall for progression through the game’s 100 levels. Lives aren’t the only thing shared as players are working together towards a combined score. While there isn’t much room in the way of in-depth strategy, considering the pace of the game, there are some on the fly decisions that lend themselves well with the additional player in co-op. Baiting enemies to follow one player, while the other works on saving just the humans was one thing we found ourselves naturally doing. As this is an arcade style game where scoring is a focus, you’ll be happy to know the leaderboards in the game are shared between the PC and PS4 platforms. There are little icons that denote which platform the score was achieved on, but having these larger leaderboards are a welcome addition for arcade fans. While Nex Machina is a simple game in concept, the depth and replayability of the levels themselves make it quite addictive. The pacing is just perfect, with little touches like respawning after a death as one seamless camera movement, that never take you out of the action. I found myself constantly replaying the early levels to uncover all of the secrets and of course, maximize my score. The game feels like a 2017 version of Robotron 2084, arguably one of the greatest twin-stick shooters ever created, and considering the joint development effort with Eugene Jarvis - this clearly has paid off. Co-Optimus game reviews focus on the cooperative experience of a game, our final score graphic represents this experience along with an average score for the game overall. For an explanation of our scores please check our Review Score Explanation Guide. Page created in 0.9514 seconds.